This product is discontinued and replaced by the Dynamics Cart and Track System. The Vernier Dynamics System is a low-friction black anodized track and optics bench combination designed for kinematics, dynamics, and optics experiments. 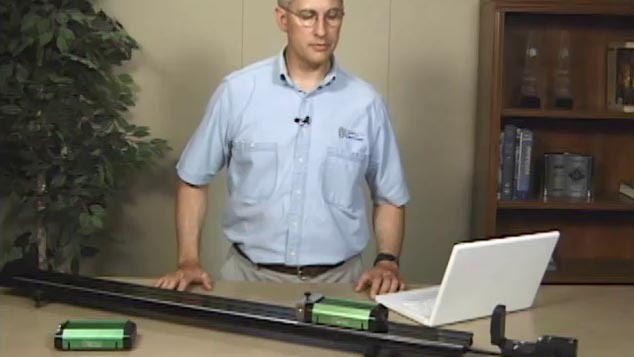 Use the Vernier Dynamics System to improve your kinematics and dynamics experiments. The Vernier Dynamics System is ideal for studying Newton’s second law, acceleration on an inclined plane, momentum, and much more. Vernier sensors such as our Motion Detector, Dual-Range Force Sensor, Wireless Dynamics Sensor System, Photogate, and Accelerometer easily attach to the Vernier Dynamics System. Make the most of your track by adding the Vernier Optics Expansion Kit for studying optics. You should also consider the Vernier Motion Encoder System, which adds an optical motion encoder for the ultimate in dynamics systems. A demonstration of impulse illustrating the changes in force and velocity experienced by a colliding Dynamics Cart striking a bumper. This experiment employs a Dual-Range Force Sensor and a Motion Detector and is found in Physics with Vernier. Sample data demonstrating the variation of force and change in position experienced by a colliding Dynamics Cart striking a bumper. This experiment employs a Dual-Range Force Sensor and a Motion Detector and is found in Physics with Vernier. Symmetry in position and velocity during the collision of two Dynamics Carts of equal mass and initial speed. This demonstration of the Law of Conservation of Momentum employs two Motion Detectors. Studying dynamics? Vernier's Staff Scientist guides you through the fundamentals of setting up the Vernier Dynamics System. The Vernier Dynamics System with Long Track includes the parts listed above but substitutes a 2.2 m track for the 1.2 m track.